Time is flying by with our Calling it Home and House Beautiful One Room Challenge and we're already in Week 2! Last week I shared my completed One Room Challenge Rooms - Lily's Room (Spring) and my Principle Bedroom/Office (Fall) as well as the space that we're making over this time - our stairway! Our stairway is the only area in our home without a window and natural light. Yes - we could install a window or light tube but I keep telling myself "this is not our forever home" and not worth the investment. So how can we make this transition space special and take advantage of the 12 foot ceiling height on the landing and a tonne of wall space? A library and art gallery of course! If you've read my blog, Instagram or viewed my Pinterest boards you will not be surprised that Jenny Komenda of Little Green Notebook, Jenny's Print Shop and Juniper Studio is a major source of inspiration for me in general and this project is no exception. Her home library is absolutely stunning! We're going for the same approachable feeling that we created in our family room downstairs except this time we have the height for a rolling ladder! This stairway library will house Matthew and Lily's favourite books making it easier for reading at bedtime as the library will be located on the landing just below the bedrooms. Similar to Jenny's library we will have a row of built-in cabinetry across the bottom which will provide great storage for soft cover books, magazines and craft supplies. Our lower pots and pans drawer that currently holds craft materials in the kitchen will be reclaimed for pots and pans! I am really looking forward to the extra storage and ability to put everything in one place. White walls will provide a perfect backdrop for our collection of art and family photography. We took down the kids bulletin board art wall providing ample space to showcase some Matthew and Lily originals in special frames. 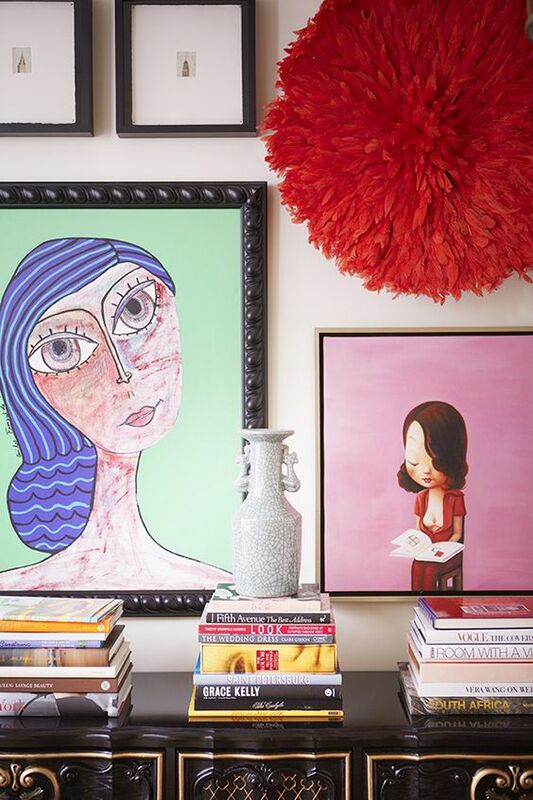 I love the look of loosely arranged art in mismatched frames and after seeing Morgan Hutchinson's dining room a few years ago I knew I would try to create a gallery wall like hers one day. Now is my chance! After just one week everything was removed from the walls, we (my contractor/brother Paul from Brancon and I) patched, sanded, primed and painted the entire stairway in Benjamin Moore's "Cloud White". Our project will really start to take shape over the next week as the hardwood floors, cabinetry, bookcases and rolling ladder are installed. I can hardly wait to show you how we incorporate some amazing thrift store and online second hand finds! If you have a chance take a look at the progress other Guest Participants and Featured Designers have made after just one week!